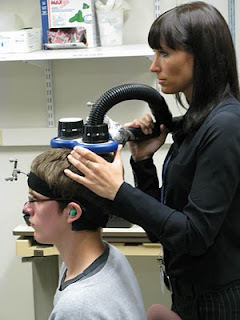 Regular followers of this blog know I’ve been involved with the TMS lab at Beth Israel Deaconess Medical Center in Boston. Scientists at the lab are using high powered magnetic fields to induce tiny electrical currents in the brain, thereby changing the way we think. The changes introduced by TMS are temporary, but for some of us, the are providing a foundation for lasting beneficial brain change. This is an account written by one of the study participants last week. W__ is a single female professional, about my age, with Asperger’s. Why do I describe her that way, you ask? I say she’s single because she lives alone. That means the changes she experienced had to be obvious enough that a person would feel them all by themselves. I point out that she’s my age because older people seem to get more from these TMS experiments by their own accounts, even though the test results from the lab show young people improve just as much or more. Why would that be? I don’t know. I think her insights are fascinating. I hope you find them interesting too. Anyway, on with her story. . .
Last week, I had an opportunity to participate in a study at Beth Israel Deaconess Medical Center with Dr.'s Lindsay Oberman and Shirley Fecteau. They were stimulating certain areas of the brain that affect communication. I had a remarkable revelation during the study. I was actually able to see and hear what it is that neurotypical people see and hear during social interaction. For the first time, I was able to understand what emotions people’s facial expressions were conveying. I was able to understand the tone of voice that the person was using, and what it really meant. For example, I was able to understand sarcasm, which I normally do not pick up. This week, I see the world completely differently. I was able to understand the facial expressions and meaning behind the expressions. I was able to hear the subtleties in the tone of voice. I was able to understand that the words being spoken were not literally true, but that their true message was still clearly conveyed. I usually hear the literal meaning of the words as the main message. However, I now recognize that the literal meaning of the words was not the main message. There were many more layers of meaning in the conversation which were conveyed by expressions and tone of voices, which I did not pick up at all last week. The best way to describe the experience this week was that it was congruous. It felt right. It felt comfortable watching people interact, and I felt like I understood what was happening. Last week, there was anxiety while watching an interaction and then trying to answer the questions about it. This week, although there were a few interactions that I wasn't clear about, overall I felt like I really understood what was going on. After seeing how differently my brain was working after the stimulation, it was clear that my brain usually focuses about 90% of my attention on the literal meaning of the words being spoken. Before this stimulation, I thought that I was able to understand people's facial expressions and their tone of voice fairly well. However, after seeing the difference following the stimulation, I would say that I miss at least half the real content and meaning of ordinary social conversation. If somebody says something sarcastically, I may completely miss their intention. When people are being sarcastic, my mind tends to focus on the literal meaning of the words. If they are being blatantly sarcastic, I can understand that they don't intend the literal meaning of their words. However, my mind still tends to focus on the words said, even though I understand that's not their intention. In most cases, this feels quite uncomfortable. If people are not as blatantly sarcastic, I think I sometimes pick up something in the way they are talking which doesn't sound quite right. The tone of voice doesn't quite match the literal meaning of the words which my brain is interpreting. This also causes confusion and unease. If someone is being sarcastic, but is speaking with a very straight face, I simply hear the literal meaning of the words and don't understand their intention at all. It seems to me that this is one of the main problems with a social interaction where someone is kidding me. I hear the literal meaning of the words, which sound as though the person does not like me, or does not wish me well. I don't hear the intention behind it, which is being conveyed by their face or their voice. After seeing so clearly all of the aspects of communication which are conveyed by facial expression and tone of voice, I certainly understand why many people with Asperger's have social anxiety. In some ways, it is as if you are in a foreign country, and aren't completely fluent in the language. The people speaking to you don't know that you don't speak the language, and they expect you to understand what is being said. Your experience is one of trying to understand what is being said, and having to translate what is being said so that you can understand it. It can be anxiety provoking when people expect you to be able to react in a way which you are not able to do. There's certainly a lot that gets missed or misunderstood. It's also very tiring to have to constantly try to figure out what is being said, and to be wrong too much of the time. I have great hope now that the researchers are finding some specific areas of the brain which are affected in autism spectrum disorders. As they are able to refine the stimulation techniques, they may be able to influence the brain in ways that can permanently improve communication. As I have just seen, this could be a life-changing experience for many, many people. This is some great info! My son had a year of neurotherapy, and it did help him w/ anxiety, and a few other aspie things. He's been out of the sessions for about 6 months now, and differences are noticable. He'll start back again in a few weeks. Sadly, insurance won't pay for it...which is why we had to take some 'time off'. If he had chronic constipation or migraines the insurance company would pay for biofeedback. I don't get it...have a good day! My son will be 15 in January and able to participate in the study if it is still going on next summer. Between Dr Casanova and Beth Israel I hope a treatment that works and accessible to all is here. Thanks for the update. How are you doing have the treatments effects on you lasted? My son will be part of a program using an MRI while watching facial expressions at The Children's Hospital Autism Center in Philly.. to see of course,' how his brain registers these images/social functioning, etc.. He is very excited, as I told him he gets to keep whatever compensation he receives... Chess sets here we come! I'm wondering if you experienced this change only when your brain was being stimulated, or if it is lasting beyond the time spent in the lab? This also made me think of something I saw on Discovery this week. A show hosted by Morgan Freeman featured a brain study going on where similar magnetic brain stimulation can produce a "spiritual event". Intriguing. Just this week my son Ziggy of www.4ziggy.blogspot.com states the fact that it is the tone of voice that adults use that scare him. Of course because he is nine years old now, I have always known this along with the fact of how the typicals use sarcasm. I find this study more than intriguing seeing that you have lived w/ Aspergers for so long and because of these test you can "feel". Could this be the answer? I can imagine... but, I can't. My son is undiagnosed... and has obvious Aspergian reactions to social stimuli- we will see what trying to diagnose him this year will bring. Otherwise this article brought so much hope. Thank you! I would never have dreamed something like this could work. How awesome that it does appear to be working!